We enjoyed the pineapple fruit above yesterday and it was very sweet like honey. Much much much sweeter than the pineapple slice syrup liquid in can. So much different than the common variety ones sold in the market to this honey pineapple from Sabah state the original plant came from my aunt. If you visit Sabah, don't forget to ask the farmers whether they are selling Nanas madu or the common one. 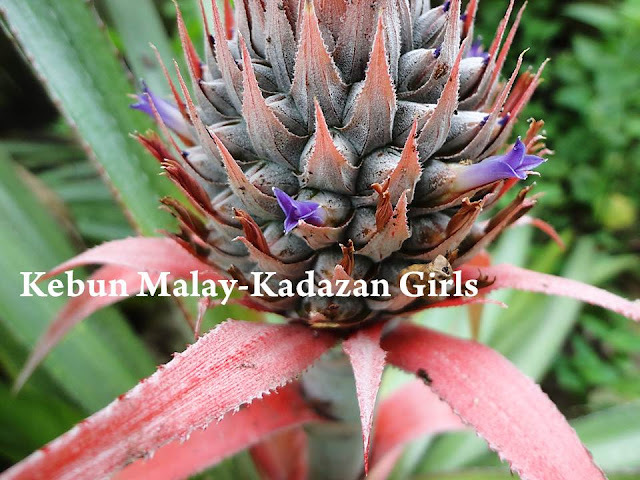 'Nanas' is pineapple and 'Madu' is honey in the national language of Malaysia. The Nanas Madu Sabah will be more expensive than the common one but worth it. I asked some middleman in one of the farmer market I went looking for some pineapple, they said they can't afford to sell them as it is expensive, a luxury item. Anticipation for the coming harvest. Ours are actually growing in partial shade and they seem to be doing fine even lack of full sunlight. The fruits takes more than 2 months to ripe from flowering stage. You spent time to peel the skin and take our the 'eyes'. Then finished eating it faster than peeling the skin. 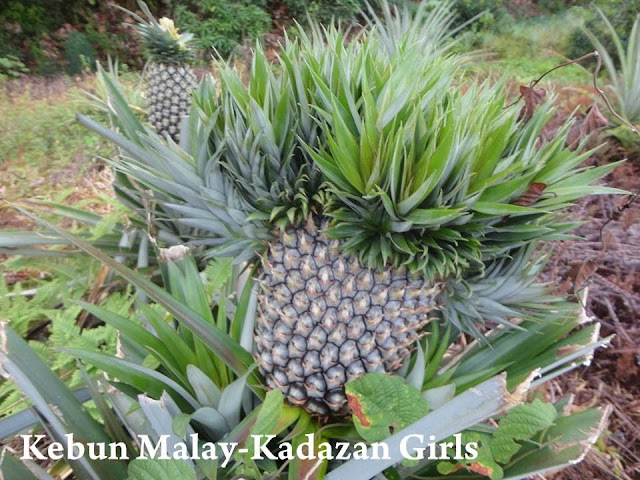 However, the sweetness of Sabah Honey Pineapples lingers in the mouth. 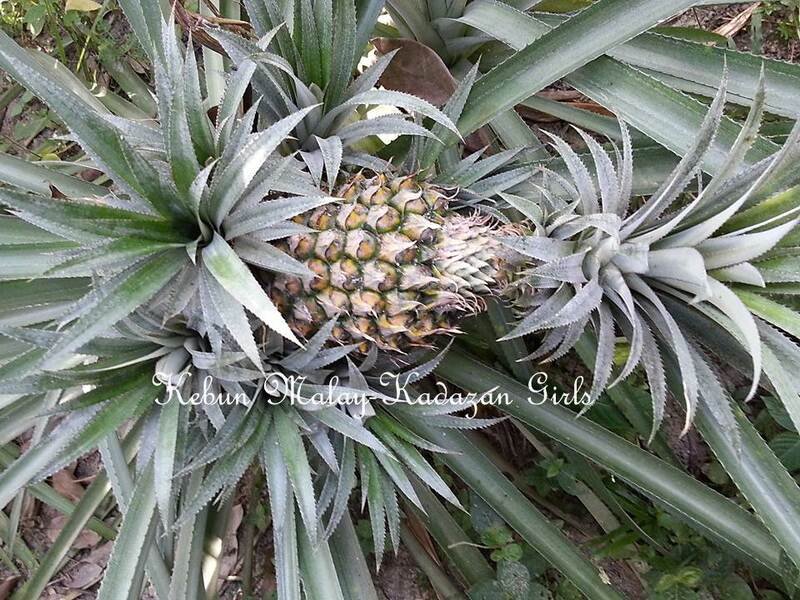 Sideshoot underneath the ripening pineapple fruit can be used to grow a new plant which gives you much faster harvest compared recycling the pineapple fruit crown top. One of the funniest Sabah Honey pineapple fruit I found in my aunt's small pineapple farm in front of the house. 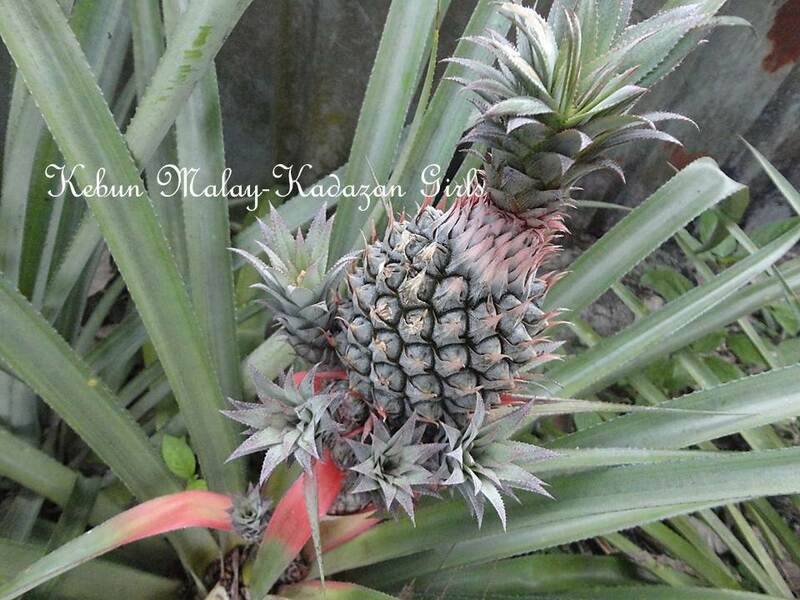 I planted some Sabah Honey pineapple plant last month before I went to Sabah and they are doing well without any care or watering. Also, planted a few plants this week too. Saturday Spotlight ~ Suburban Tomato. How cool are they? I love that you have spotlighted them. They look fabulous - I would love to eat one one day. Those are so beautiful! They would be wonderful in the garden even if they weren't so sweet. And it sounds like they are easy for you to grow too. Almost the perfect fruit if they weren't so hard to peel. dulu makcik pernah tanam nanas madu depan rumah tu tetapi berbuah hanya besar penumbuk je last sekali terbiar dan mati benihnya. It must be so nice to have pineapples growing in your own garden! Somehow I had imagined they would be really difficult to grow. I suppose you just need the right weather - so a definite No-No for us here in the UK! I wish I could grow them in Poland, I love their taste. Hi, my hubby and I are interested in growing plants/veges for food. Do you let visitors come see your garden? We would love to see what you grow in your garden. And talk to you about what plants are suitable for our tropical climates. I live in Petaling Jaya. Thanks! Now I have to complain...how can you show this in your blog?? I love pineapples but would not be able to grow them in this cold weather, and you are showing us such lovely honey-filled pineapples? My mouth is watery...How much space does it take? I planted two small plants in the greenhouse with the hope that they will survive the winter. Let's see. I have grown 2 pineapple trees for more than 1 year. Yet to see any pineapples. Wow.. Yummy yummy. I love pineapple. Just wondering where did you get the seedlings from. Mind to share? I'm from KK, Sabah. Those pineapples are just beautiful. It is always wonderful to see fruit growing. I have never heard of Sabah Honey Pineapple! 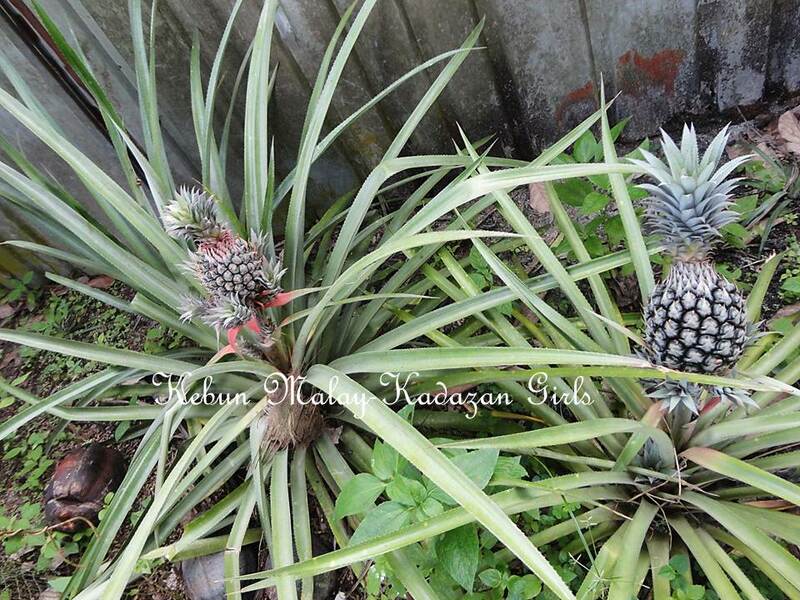 I have a few pineapple varieties growing right now, Yan Kee, Josephine and Philippine. Wow, as sweet as honey, sedap! Have never seen pineapple flowers before, thanks for the photos. hi diana, hope all is well with you. Coming by to wish you Selamat Hari Raya, enjoy the festival! I didn't know there is a variety called Sabah honey. Now I'm curious about its taste. Is it consistently sweet or is there a specific time to eat it? Congrarulations on the new baby and moving see much time I have not been on the internet. I am just going to catch up. Where have you got vanished? I hope everything is fine with you and your family. Where are you? I hope everything is fine with you and your family. It has been almost 3 months since you posted. I see you have not posted in a little while. I hope that you and your family are doing alright. There are many of us gardeners who garden because it is our best therapy from the demands of life. Best wishes and thinking of you. Nice to know you like it that I link it to the Saturday Spotlight. Don't forget to try them went you visit Sabah. Sue ~ Probably the origin of the word came from the same source and evolved. Michelle ~ They do look ornamental in the garden right. Yes once established they kind of look after themselves. CikManggis ~ Mungkin tak cukup zat kut atau faktor cuaca. Mark ~ With the right weather, they are easy to grow. But you have to wait about a year to harvest the fruit. Dewberry ~ You can try growing them on the heap of compost in a green house to warm them up. Erin ~ At the moment due to the kids weekend activities we pretty in a rush all the time. You can space them like growing zucchini I think. I tried growing them before "outdoor" in Adelaide with neglect did not grow much but the plant never died. A must on your balik kampung trip when in season :). Depending on the variety and on which part the crown was taken the harvest time will varies. Suckers are much faster. Fay ~ Yes in Sabah also very rare kan. Harga boleh tahan. My aunts has been growing them for years. So my mother brought some back to grow here. Hi Kadazan sis. TRG ~ Yes some species is so sweet to consume just like that. The sweet ones will be a waste not eating them just naturally fresh like that. I have not made any experiment in the kitchen lately. Yes seeing them growing although taken time is satisfying. True gardening has been helping me a lot to keep me sane. That is a nice collection of pineapple you have in your garden. It is so a rare chance to notice the flowers. I am glad had the chance to snap some photo of the flowers. Why not growing them for fun :). Did the same thing to when we were living in the Adelaide. Just to watch how tolerant plants are. Thank you Thank you so much for your concern and thinking about us :). Thank you for the wish and this coming Raya is getting close too. Bom ~ It is consistently sweet if you pick them the right time. I noticed even the color is not dark yellow yet the squirrel has bite them. Selamat berkenalan terima kasih berkunjung. Thank you she is 1 year and a 1/2 now. Now is my turn to catch up. Jangan terlampau banyak air masa awal tiada akar nanti mudah reput. Enjoying many different type of fruit while visiting Malaysia is a must! I wish to visit Hawaii someday, many plants I would like to see. We have started gardening for about 4 years now since I had my first pregnancy scan with Rayyan and he was diagnose with cardiac defect.We want our children to know where veggies come from and eat vegetable which is chemical free. Furthermore taste the true flavour of heirloom vegetables and fruits. Our gardening adventure started in Adelaide (blog archive 2010-2012) with Mediterranean / Warm Temperate Climate. Now we grow our own food in Tropical Climate in a green zone 20 less kilometre away from the Malaysia capital city Kuala Lumpur. Flowers - Beauties at my front yard in the early morning!
. . . cathy@home . .
My new gardening blog on Tsu. - https://www.tsu.co/Takaeko I created a new blog on Tsu. Please make your Tsu accout to visit there if you like. I 'm trying to writ blog in English. "The Italian" - After a long battle with cancer my beloved husband a/k/a "The Italian" passed away peacefully this past Monday. how my garden grows, hopefully! Amaranth, Angled Luffa, Bush Bean (Redland Pioneer), Carrot (New Red Kuroda ), Capsicum, Chili, Climbing Bean (Purple King),Cucumber, KangKung, Okra, Pak Choi (Mei Qing Choi F1), Sweet corn. Calendula (Sunshine), Sunflower (Evening sun, Mammoth), Zinnia (Lilliput Mix). Vegetable Bush Bean (Redland Pioneer), Climbing Bean (Purple King), Carrot (Afghanistan, Dragon, Topweight), KangKung, Pak Choi (Mei Qing choi F1), Parsnip, Sweet corn, Wong Bok. Alyssum (Royal Carpet),Aquilegia/Columbine (McKana's Giant), Bellis Perennis, Calendula (Sunshine), Cineraria, Daffodils, Foxglove (Excelsior Hybrids), Iris, Larkspur (Imperial), Marigold (African/French), Nastartium (Jewel mixed), Stock (astral), Rose geranium (cutting), Sunflower (Evening Sun, Mammoth),Sweet Pea, Zinnia (Lilliput Mix). Beetroot,Bok Choy, Bush Bean (Redland Pioneer), Broccoli (Italian Sprouting, Purple Sprouting)), Cabbage,Cauliflower (All Year Round, Snowball, Sicilian Violet), Carrot (Afghanistan, Dragon, Topweight, Early Nantes, Manchestar Table) , Celery (Crisp & Tender), Chinese broccoli (Kailan), Choy sum, Da Cheong Chae, Daikon, Florence Fennel,Giant Purple Mustard, Kale (Nero Black), Kang kong (Water Spinach), Kohlrabi (Purple Vienna),Leek (Musselburgh), Pak choi, Parsnip, Peas (Telephone), Potato, Radish, Snow pea, Spring onions, Sweet Corn, Swiss Chard (Rainbow Mix, Red),Turnip, Wong Bok. Herb Basil (Lemon), Chervil, Chinese celery, Chives (seeds/divisions), Coriander, Dill, Epazote,Fennel, Parsley. Alyssum (Royal Carpet), Aquilegia/Columbine (McKana's Giant), Bellis Perennis, Calendula (Sunshine),Carnation (seed /cuttings),Cineraria, Daffodils, Foxglove (Excelsior Hybrids), Hollyhock, Larkspur (Imperial), Marigold (French), Jonquils, Nastartium (Jewel mixed),Polyanthus (division), Poppy (Shirley Double Mixed), Pyrethrum (divisions), Ranunculas, Rose geranium (cutting), Stock (astral), Viola. Beetroot,Bok Choy, Broccoli (Italian Sprouting, Purple Sprouting), Cabbage,Cauliflower (All Year Round, Snowball, Sicilian Violet), Carrot (Afghanistan, Dragon, Early Nantes, Manchestar Table, Topweight) , Celery (Crisp & Tender), Chinese broccoli (Kailan), Choy sum, Da Cheong Chae, Daikon, Florence Fennel,Giant Purple Mustard, Hon Tsai Tai (Purple-Flowered Choy Sum), Kale (Nero Black, Red Russian), Leek (Musselburgh), Lettuce, Kohlrabi (Purple Vienna),Komatsuna, Mizuma,Pak choi, Parsnip, Peas (Telephone), Potato (Kennebec, Kipfler,Nicola), Radish (Long White Icicle), Red Choi, Silverbeet, Snow pea, Spinach (Bloomsdale),Spring onions, Strawberry (Seeds), Swiss Chard (Rainbow Mix, Red), Tatsoi, Turnip, Witloof Chicory. Chervil, Chinese celery, Chives (seeds/divisions), Coriander, Dill, Epazote, Garlic, Fennel, Parsley. Alyssum (Royal Carpet), Calendula,Canterbury bells (Cup and Saucer), Hollyhock, Larkspur (Imperial), Nastartium (Jewel mixed), Pansy, Poppy (Opium, Shirley Double Mixed), Pyrethrum (seeds), Ranunculas, Rose geranium (cutting), Stock (astral), Tulip, Viola. Broccoli (Italian Sprouting, Purple Sprouting), Cabbage, Cauliflower (All Year Round, Snowball, Sicilian Violet), Carrot (Manchestar Table, Topweight), Chinese broccoli (Kailan), Daikon, Florence Fennel, Giant Purple Mustard, Hon Tsai Tai (Purple-Flowered Choy Sum), Leek (Musselburgh), Lettuce, Kale (Nero Black, Red Russian), Kohl Rabi (Purple Vienna), Komatsuna, Mizuma,Pak choi, Peas (Telephone, Purple-podded), Radish (Long White Icicle, Watermelon), Onion (Aussie Brown, Creamgold), Red Choi, Red Onion (Odourless), Silverbeet, Snow pea, Spinach (Bloomsdale),Spring onions, Strawberry (Seeds), Swiss Chard (Rainbow mix, Red), Tatsoi, Turnip, Witloof chicory. Chervil,Chinese celery, Coriander, Dill, Fennel, Garlic, Parsley. Canterbury bells (Cup and Saucer), Viola. Broccoli (Italian Sprouting), Cabbage, Carrot (Manchestar Table, Topweight) , Florence Fennel, Hon tsai tai, Komatsuna, Peas (telephone), Onion (Aussie Brown, Creamgold), Potato Onion, Radish, Red onion (Odourless), Shallot (Matador), Snow peas, Spinach (Bloomsdale). Onion (Australian Brown, Creamgold), Potato (Nicola), Red Onion (Odourless), Spinach (Bloomsdale), Strawberry (Runners). Carrot (Topweight), Leek (Musselburgh),Potato (Nicola, Desiree, Royal Blue), Tomato (Challenger), Turnip. Gaillardia, Gerbera (division), Marigold (African), Sunflower, Tree Dahlia (stem). Beetroot,Bush Bean (Redland pioneer), Carrot (Topweight), Celery, Choko, Cucumber (Green Gem), Eggplant, Hon tsai tai, Komatsuna, Lettuce, Parsnip, Potato (Desiree, Royal Blue), Pumpkin, Spagetthi Squash, Sweet corn, Tomato, Turnip, Red Choi, Spinach (Bloomsdale), Zucchini. Chinese Celery, Chives (seed), Rosemary (cuttings). Cosmos, Gaillardia, Gladiolus, Marigold (African), Portulaca (cuttings),Sunflower, Tree Dahlia (stem), Zinnia (Lilliput mix). Angled Luffa, Bitter gourd, Bush Bean (Redland pioneer), Capsicum, Carrot (Topweight, New Red Kuroda), Chili, Chives, Climbing bean (Snake Bean, Purple King), Choy sum, Cucumber (Apple, Green Gem, White Spine), Da Cheong Chae, Eggplant, Honeydew, Kang kong (Water Spinach),Komatsuna, Lettuce, Okra (Clemson Spineless, Burgundy), Pak Choi (Mei Qing F1), Pattypan squash,Pumpkin, Red Choi, Rockmelon, Spagetthi Squash, Spinach (Bloomsdale), Sugarcane (stem), Sweet corn, Sweet potato (tuber/shoot), Tomato, Watermelon, Zucchini. Basil (Lemon),Chives (seed), Galangal (rhizome), Lemon Grass (root), Rosemary (cuttings), Vietnamese mint (cutting). Cosmos, Gaillardia, Marigold (African), Portulaca (Seeds/Cuttings), Sunflower, Zinnia (Lilliput mix). Amaranth, Angled Luffa, Bitter gourd, Bush Bean (Redland pioneer), Capsicum, Carrot (Topweight, New Red Kuroda), Chili, Chinese Broccoli (Kai laan), Climbing bean (Purple King, Snake Bean), Choy sum, Cucumber (Apple, Green Gem, White Spine), Da Cheong Chae, Eggplant, Honeydew, Kang kong (Water Spinach), Komatsuna, Melon (Turkish Leopard),Okra (Burgundy, Clemson Spineless), Pak choi (Mei Qing F1), Pattypan Squash, Pumpkin, Red Choi, Rockmelon, Soy Bean, Sugarcane (stem),Sweet corn, Sweet potato (tuber/shoot), Tomato,Watermelon (Candy Red), Yam bean (Jicama), Zucchini. Basil (Lemon, Thai), Chives (seed/division), Galangal (rhizome), Ginger (Rhizome), Lemon Grass (root), Tumeric (rhizome), Vietnamese Mint/Laksa/Kesum Leaves (cutting). Cosmos, Portulaca (Seeds/Cuttings), Sunflower, Zinnia (Lilliput mix). Amaranth, Angled Luffa, Bitter Gourd, Bush bean (Redland pioneer), Capsicum, Carrot (New Red Kuroda),Chili, Climbing Bean (Purple King),Cucumber, Kang kong (Water Spinach), Okra (Burgundy, Clemson Spineless),Pak Choi (Mei Qing F1), Sweet corn, Sweet Potato (tuber/shoot), Yam Bean (Jicama), Zucchini. Basil (Lemon, Thai), Ginger (Rhizome), Lemon Grass (root), Tumeric (rhizome), Vietnamese Mint/Laksa/Kesum Leaves (cutting).